Who enjoys free-motion quilting? I have been doing quite a bit of quilting lately and I am really starting to love it but it wasn't always that way. I have taken a fair amount of free-motion quilting classes (with good instructors!) but I was always hesitant to actually start quilting on a quilt top in case it wasn't perfect. (Or at least REALLY good.) 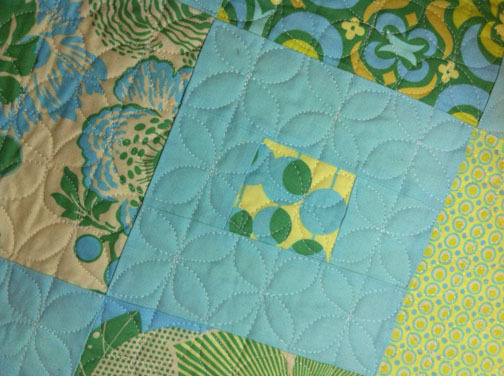 If you've ever taken a quilting class, no doubt you've heard that it just takes practice! Now in your head you know it's true. But it's hard to take a quilt top you've worked so long on and just go for it on the quilting. I've decided that life is too short (and my sewing room way too full) to keep unfinished quilt tops laying around, so I've just started quilting them. Not only has it made me feel better to mark something off my list of things to do, but my quilting skills have improved and I even have a little stash of finished baby quilts just in case I need a gift! If you are interested in improving your quilting skills start out by making a quilt sandwich with some muslin or old fabric. I made two for a class that were both 1 yard by about 42" which is a good size. Just lower the feed dogs on your machine (look in your machine manual if you don't know how to do it - most machines nowadays should be able to do this), and start quilting! Here's some practice quilting - I just used whatever thread was in the machine and tried out patterns from books (recommendations below). Now, some of it's not great, but I could see improvement even after working on a particular design for just a few minutes. Having a spare quilt sandwich like this is a great idea so that when you do want to try a new quilting design for a quilt you're getting ready to finish, you can do a little practicing. Sometimes I'll even draw the block shape on the muslin with a disappearing pen to practice different ideas. Once I decided to just do it (TM Nike), I found a baby quilt top I made a long time ago and decided on a super cute quilting pattern that I learned in a class with the awesome Elizabeth Hartman. This adorable flower design was actually pretty easy and didn't even take that long once I got going. And people LOVE it! I was so inspired when I finished it that I got out another small quilt top. For this one I used a zig zag-ey line with a loop that is from Christina Cameli's book First Steps to Free Motion Quilting. As you can see, some of the rows are closer together than other ones, and sometimes the loops are farther apart than other times, but when you look at the quilt as a whole, it's not really noticeable. I most recently took a class with Angela Walters who is, of course, awesome. She had tons of great ideas, including some that I was able to use in this quilt. Angela taught the basic clamshell design plus these fun variations, and I love the ribbon candy motif! That one definitely took some practice, but it turned out good on this quilt. It helps to do this design in rectangular sections of the quilt so that you have guidelines for the top and bottom of the design. I also love Elizabeth Hartman's books for quilting ideas even though their focus is on making the quilt tops and not as much on quilting. And if you ever get the opportunity to take classes with any of these authors, do it! I hope this has given you a bit of inspiration to try quilting if you've been worried. In my experience, I've noticed that when I show a finished quilt to someone they all think it's pretty awesome. Of course I know where I made a weird shape, or where my stitches got way too long, or I ran into a corner and didn't know how to get out of it. But if you don't point out those "mistakes" to people, they won't find them. So don't be so hard on yourself, and just have fun with it! Got any quilting advice or challenges you'd like to share? Let us know in the comments!